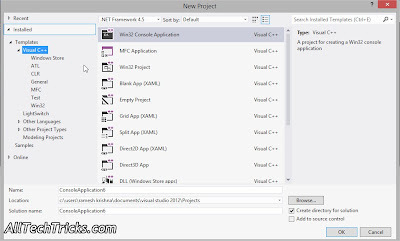 First get the Visual studio from here (Official Link) (We recommend you to download the ISO copy). After Downloading the Visual Studio from Microsoft, Run the installation and wait for some time to complete installation( this takes some time to install). 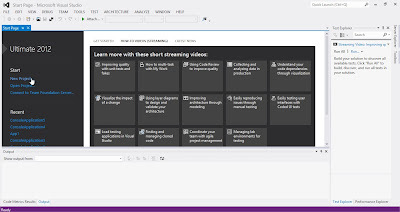 After completing the Installation On your computer “Run Visual Studio 2013″ As soon as You start visual Studio, You will be presented with Visual Studio Start Screen. And now click on Visual C++ and Select “Win32 Console Application“, and Hit on OK. In next Window click on “Finish” button. Now You will be presented with your workplace where you can starting writing your code. 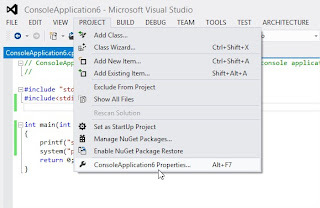 By default Visual Studio adds the stdafx.h library and some default code. You can overwrite it and write your own code.And there is no need to add the conio.h header file to your code. After completion of writing your code don’t forget to add the system(“pasue”); before return statement on your code. and Select the “Console Application Properties” (Alt+F7). Now Hit on “Local Windows Debugger” to run your code!. 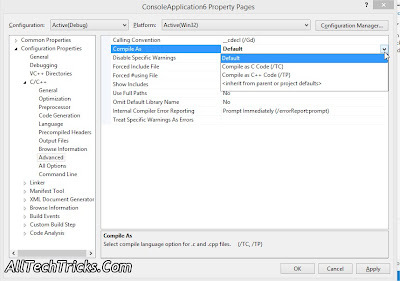 Compiling C++ on visual studio 2013 is much easier than compiling C code. Now You will be presented with your workplace where you can starting writing your code. Before writing the code Don’t forget to add this code After link-section. using namespace std; and add this code with after completion of writing your code system(“pause”); and hit on Local Windows Debugger to compile your code! Code Blocks is one of the Best free and open source, cross-platform IDE which supports multiple compilers including GCC and Visual C++. It is developed in C++ using wxWidgets as the GUI Toolkits. <a style="margin-left: 1em; margin-right: 1em;" h….